Placing these under the front of trailers when no tractor is attached will keep the trailer from shifting or upending during loading operations. 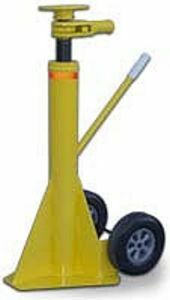 These can also be used to level a trailer parked on an uneven surface or for a few more inches of lift to reach a dock. Our trailer jacks have a wide stable base to help prevent them from sinking into soft ground. Lift-Rite 5,500-lb Pallet Jack - 27" x 48"